Ooouuuh! Wow! That looks awesome! Thanks Juban and Caradilis for the kind feedback. Looks brilliant! I like it. I wonder - did you draw some inspiration from the eruption outside your home for the one on the hill in the image there?! I feel somewhat late to the party on this one, but I also teach STEM and this looks like an amazing project tackling some important issues! I will definitely add it to the Steam wishlist! Thanks Lizard! Good luck with your STEM teaching. I coached a lot of Lego robotics and some VEX during my time working with the at-risk urban kids, and it was some very rewarding work. Lego robotics workshops are actually my favourite to teach! Especially with at-risk/SEN/'disengaged' students. I'm definitely interested in getting a copy of Neofeud when I've got the funds to invest, it might provide a nice jumping-off point. Would I be alright to develop something around this work, if I could come up with something? Obviously you'd be fully credited and I wouldn't be messing with Neofeud itself - and I'd be happy to provide you any resources around it that I come up with. Go ahead! Feel free to develop whatever you'd like based around Neofeud. May be of interest to anyone developing or interested in getting into indie game development, especially regarding business, marketing, and attempting to make it as a sustainable indie game company, based on my own experiences running Silver Spook Games. Hey guys, just a heads up: Neofeud sale ends in 3 days! Some recent reviews on Steam: “Neofeud is an ambitious, atmospheric cyberpunk scenario... Oh, and it might also be one of the best adventure games I have played in a while." Oops, I should've mentioned the sale in the newsletter... Hope it's going well! No problem! Yes the sale has gone quite well this time around. 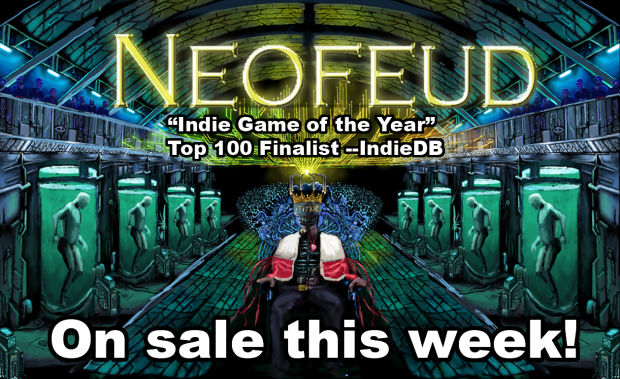 Speaking of the sale, Neofeud sale ends tomorrow!